It calls to mind images of hardscrabble laborers. Weathered buildings constructed from granite and timber. A bunch of things made by hand. Yeah, sounds like the makeup of a fantastic bar to us, too. Say hello to Granary Tavern, an old-timey-feeling saloon housed in an honest-to-goodness 19th-century granary, soft-opening tomorrow. Imagine two Vermont barns. Now picture the wood from them being turned into a bar. Pack it all in a place that used to hold grains in the 1800s. That’s this. 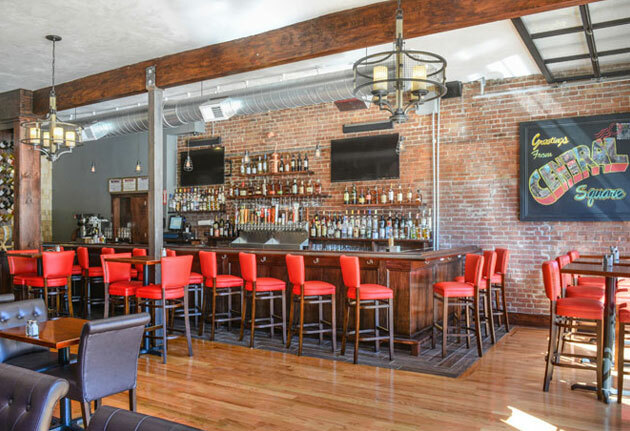 So now when your post-work plans involve loosening the tie and catching the game, you’ll grab a leather booth in here. (Tip: get one by the retractable windows, allowing in the Greenway air.) As your coworkers trickle in, you’ll already be un-office-ing, courtesy of mason jar cocktails and small bites like Scotch eggs and grilled oysters. Even fondue made with Harpoon IPA (saves you the trouble of mixing them in your stomach later). After the game, head downstairs amongst the original granite and exposed timber (aka a Colonial man cave). There, you’ll down pints of Pretty Things and Tröegs dispensed from a custom tap constructed from old iron plumbing pipes. Yes, they cleaned it first.